Every time a customer tells us that you sent him or her to A.J. Michaels, we'll send you up to $100, or a credit for A.J. Michaels services at your home *. We call it a Referral Reward. For starters, it means we did the job right. No matter how much we offer, you wouldn't recommend us to a friend or family member unless you were absolutely satisfied. That's why we're extremely proud of the high number of customer referrals we receive every year. Download and print the referral card below. Give the completed card to your A.J. Michaels representative, or in Baltimore call 410-435-5400, in Annapolis call 410-573-5858 or fill out the form on the right for a free estimate on a new system or to request service for your heating, air conditioning, plumbing and home performance needs. You'll be rewarded, and your friend or family member will be satisfied. There's no doubt about it. Download and print your referral card. *To be eligible for the A.J. 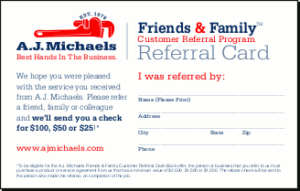 Michaels Friends & Family Customer Referral Cash Back offer, the person or business that you refer to us must purchase a product or service agreement from us that has a minimum value of $2,500, $1,500 or $1,000. 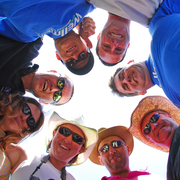 The rebate check will be sent to the person who made the referral, on completion of the job.